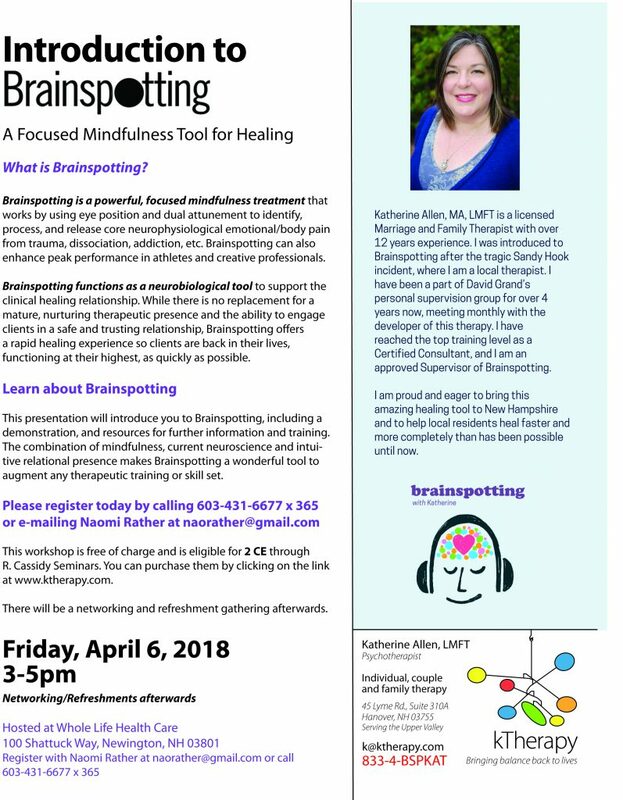 I am pleased to announce that I will be giving a SECOND Introduction to Brainspotting Workshop for the NH Seacoast region. It will be Friday, April 6, from 3-5pm and will followed by a refreshements/networking gathering. It is being hosted by Naomi Rather at Whole Life Health Care, located at 100 Shattuck Way, Newington, NH 03801. You can register with Naomi directly at naorather [at] gmail [dot] com or by calling 603-431-6677 x365. There will also be an opportunity to purchase 2 CEs through R. Cassidy Seminars. I am excited to help bring Brainspotting to the Northern New England region. Please don’t hesitate in contacting me if your region might like a workshop as well.